Fresh seed pod on ? tree. Okay, now we have the name-the-tree challenge:>) Found in Tacoma, WA 4 days ago. Categories: Phall Photos, Weekly Photo Challenge | Tags: fresh, Lumix, Panasonic, photograph, postaday, tree | Permalink. It appears to be a bloom-cluster of some sort…I don’t believe that it is Oak, the leaves roughly resemble an ornamental-Maple…I couldn’t find a match on search results…I’ll submit to a botanists… PHALL PHOTO 2013 (Fall Photo 😉 ) Do you have a wider shot? Are we sure it is not another type of plant…in a tree? I think it is a maple. No, it was a close up only. No, not 2 dif plants. Next. A popular ornamental tree in temperate climates, it is recognizable by the combination of its five-pointed star-shaped leaves and its hard, spiked fruits. It is currently classified in the plant family Altingiaceae, but was formerly considered a member of the Hamamelidaceae. I’ll go look, I just thought that it wasn’t warm enough here for kind of tree…shows what I know. These are not round, so I’m still not sure. They are elongated. That is what caught my eye…that green! I felt this strange feeling in my stomach when I saw that new growth inside all that green. Thanks for stopping in, enjoy your visit. Very neat. I’ve never seen that before. 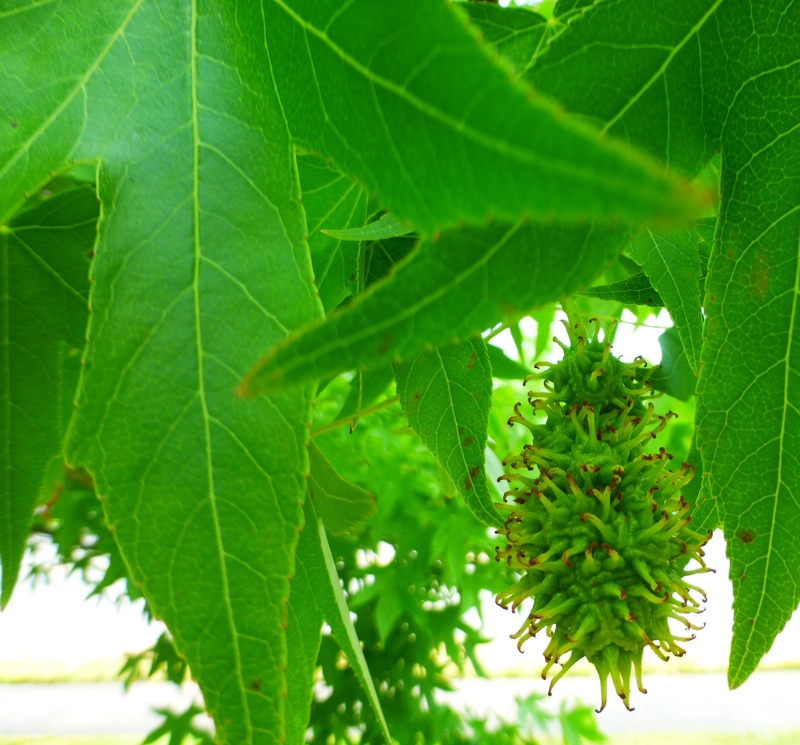 Sweetgum? Nothing like that in Arizona! That is what everyone guesses, but it is elongated, not round, so….???? “This is the page featuring a single species. Photographs are presented per individual to make it possible to asses how much variation is possible between individuals within the species. You have the 5-point serrated leaves, with a lobe about midway of the leaf spar, the fruits are identical, sans the degree of the lack of elongation represented on most other images. I think the image above, is a little less round. The location is within the temperate climate zone…the lower range of climate zone, and any number of factors may be responsible for the difference of this specimen from those of the other more common areas of habitation. As you recall, do the other related images depict the bark, and stature of this tree? Don’t recall. 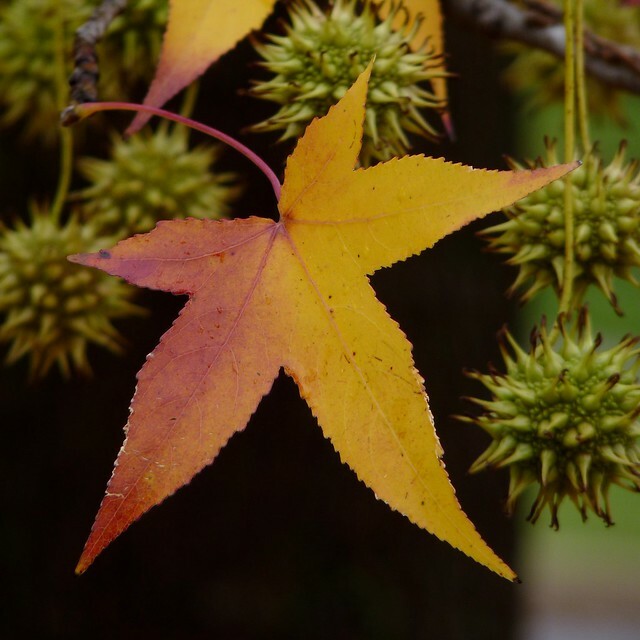 Thanks for the research..all votes in…sweetgum! Douglas Spirea, my twitter friend. 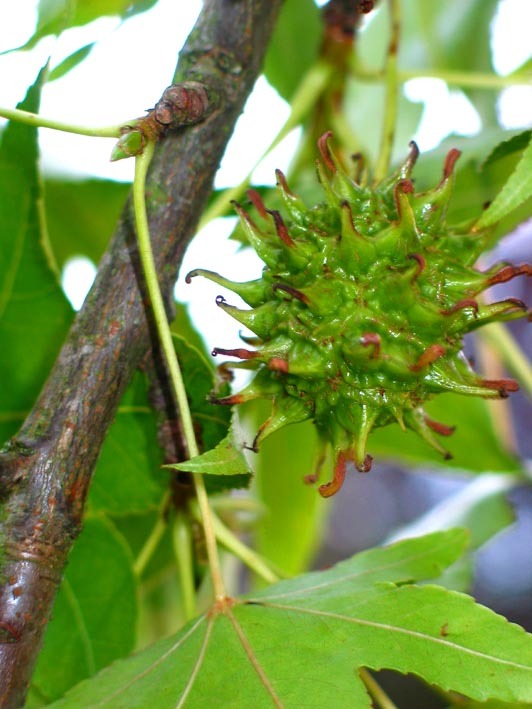 We are all stumped because it looks like the seed pod/fruit of a sweet gum tree, but is elongated not round. I’m going back to that tree Tuesday and will investigate this mystery further. Patti AND thanks for the tweet!!!!!! If you can and will please…get a shot of the whole tree, and a close-up, maybe macro…of the trunk… Thank you!